Wearing shorts and a sweater, as the sun came out and things moved toward warm, but only actually got there–on our hillside–for a couple of mid-day hours. Watching youngish deer wander through our newly shorn and fire-proofed property and remembering that we need to start keeping our gates closed, if we want the dogwood and fuchsias to survive. A little quiet time each evening, as husband and son went for driving-practice outings. Along with starting the car on Monday morning to see the gas gauge just tipping the top of the reserve light. Attending a parent panel on the college-application process and hearing a few scary things but, mostly, a lot of sanity and reassurance. Making progress on fiction writing AND work writing, reminding myself that I may not be able to get it all done as fast as I’d like, but I can still get it all done. 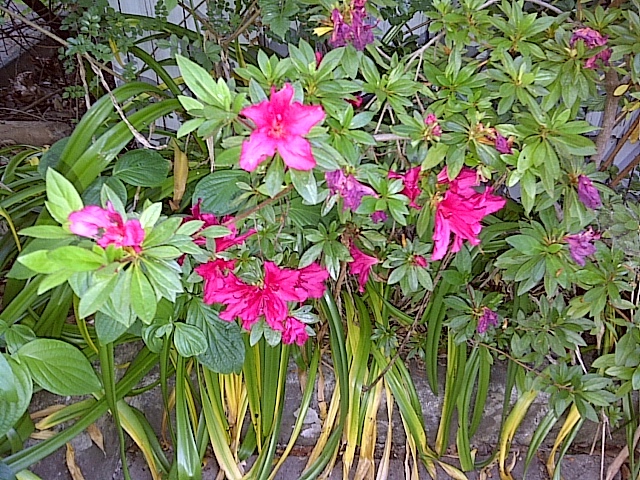 And one photo from inside those gates, the plant (azalea?) that five years after planting, my husband was calling plastic and swearing would never bloom. Some things just take a while, right? Indeed. Things do take time. The one drawback of the internet is getting accustomed to instantaneous everything, and expecting all things in the outside world to respond the same way. Nice post. Really enjoyed it. It sounded so much like something I’ve been through a few times. Keep it up. Wait! Are those plastic flowers growing on that shrub? Not bad for plastic. Glad it’ warming up there. The weather has been kind of lovely here. Lots of variety but at least we aren’t scorching yet! Not plastic, but the plant did seem to suddenly get “happy” in the last year or so (honestly, about 15 years after we planted it!). I think it’s something to do with drought-resistant plants–they look like nothing for a while, and then they go crazy? Enjoy your sunshine!